Not sure how to ask your clients to share their feedback on your True Local listing? We’ve written a few easy ways that will help you get the ball rolling. It’s a good idea to ask for customer feedback soon after they’ve completed their experience with you. Ideally, you should reach out to your customers within a couple of days whilst the experience is still fresh in their minds. Thank you for your recent experience with our business, <insert your business name>. If you have a moment, we’d really appreciate you taking the time to write a review about your experience with us on our True Local business listing. Your feedback will enable us to continually improve as a business as well as give any potential customers a chance to read about the experience you had with us. Once again, we want to thank you for your business and look forward to working with you again in the near future. Just ask – simply let the customer know that you’d appreciate any feedback they might have and that they can share their experiences on your True Local business listing. 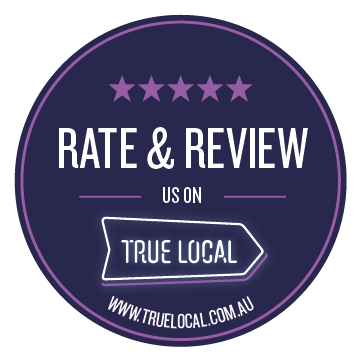 True Local Rate & Review window stickers – place these stickers in a prominent place where customers can see them. 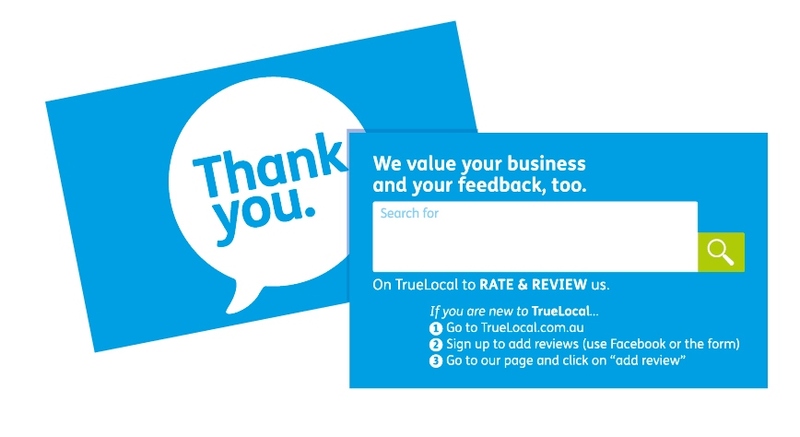 True Local Thank You cards – hand these out to your customers at the register so they can take it home as a reminder and it will prompt them to leave you a review at a convenient time. Get social – your happy reviewers are also likely to follow your Facebook page. Keep them engaged with your business by posting links to your listing and mentioning some of the great reviews you’ve received. Make sure you balance these posts with other valuable, relevant and fun posts too. Your website – add a link to your business listing so people can find out what people have written about your business on True Local. This might encourage customers to leave their own feedback on your listing too.